Deepika took her Instagram account to appreciate the gesture showcased by the actor and thanked for the generosity. Deepika Padukone has been missing from the promotion of her much-awaited flick ‘Padmaavat’ due to the ongoing controversy. The actress has now come forward to show gratitude towards Akshay Kumar for his good gesture. 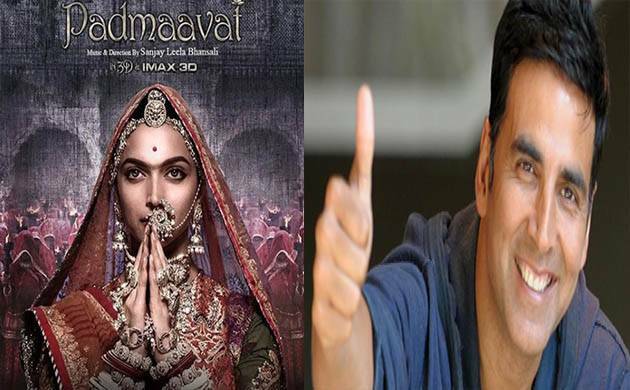 Akshay Kumar on Friday along with Padmaavat’s director Sanjay Leela Bhansali held a press conference in which he announced the postponement of his movie on the request of the director. During the press conference, Sanjay Leela Bhansali said, ‘’Padmaavat has been made after facing a lot of difficulties, we decided on release date of 25 Jan but it was with Akshay Kumar for release of his film 'PadMan', we requested him to move release date of his film ahead, he agreed, will be grateful to him for a lifetime’’. On being asked that ‘Why can’t Padmaavat move and PadMan stay?’ the ‘Toilet: Ek Prem Katha’ star said, ‘’Because, they have a reason to release at this time. It’s very essential for them to release it as quickly as possible, so I understand it. Yes, that could have also happened, but the point is not about fighting and clashing. But, at the moment the stake of their film is much more higher than mine’’. Padmaavat formerly known as Padmavati has been in headlines since its inception due to the protests by Rajput community across the country. However, the movie has finally received certification from the censor board and is now ready for the release. The movie is slated to release on January 25.